The WePlay® Whally Board is a fun balance board for kids! Inspired by a jumping fish, Weplay Whally Board is textured with waves and bubbles on the surface to provide children with tactile stimulations to feet and inspire the imagination of fish roaming freely in water. 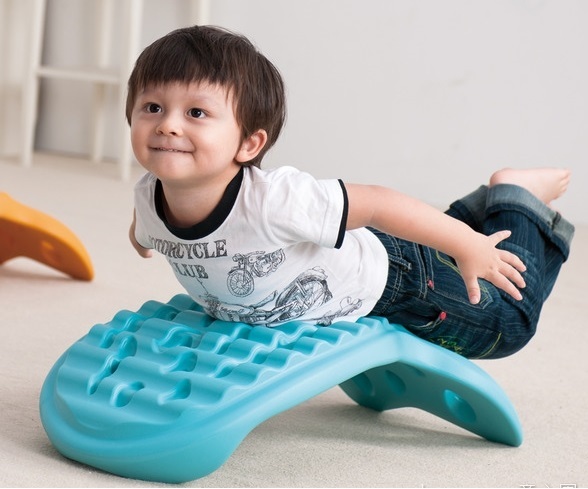 This ergonomic balance board is designed for young children to either sit in or stand on for a fun rock balancing game. Comes in Blue or Sunkist colors. 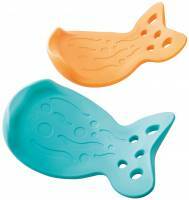 Kids can pretend they are riding on a whale or big fish! – Playing on the top side of Weplay Whally Board allows children to practice their balancing skills via core control and strengthen their motor coordination. 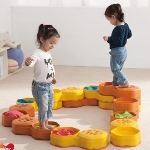 – Weplay Whally Board’s 3D wavy base design brings bumping effect while rocking to help develop children’s tactile senses. – Rocking left and right or back and forth can provide vestibular stimulations to children and enhance their development of vestibular balance. – Weplay Whally Boards can turn into a creative stepping route and help to active children’s adaptive motors and protective reaction skills. The grooved waves design on the back can prevent finger trapping injuries. Inspired by a jumping fish, Weplay Whally Board is textured with waves and bubbles on surface to provide children with tactile stimulations to feet and inspire the imagination of fish roaming freely in water. 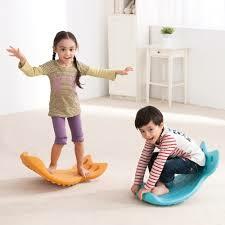 The 3D wavy base design not only offers children varied bumping funs while wobbling on Weplay Whally Board but also makes the balance activity more challenging than usual. DIMENSIONS : 20" x 14" x 7"
WEIGHT CAPACITY: Holds a maximum of 132 lbs.